Norma Bates set the standard for a crazy, controlling mother in Psycho. Margaret White was the Bible quoting, abusive mother in Carrie and Mrs. Voorhees in Friday The 13th was also a mom you might not get the warm fuzzies from. But I found a new contender for the Mother of the Horror Year 2017 — and she just goes by Mama, in the Indie flick, Who’s Watching Oliver. 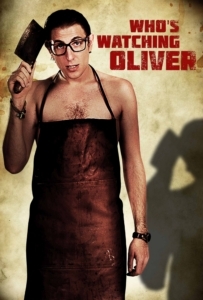 Who’s Watching Oliver tells the story of a mentally unstable loner lost in a life forced upon him. By day he hangs out in a creepy American-copied theme park in Thailand, and by night Oliver aimlessly wanders the streets and bars as his truly shocking alter ego. His only savior and possible way out of a life he is desperate to escape, comes in the form of the beautiful Sophia. With a sweet eccentricity and naivety, Sophia has no idea the danger she has put herself in. In his directorial debut, Richie Moore has brought us a depraved film that breaks all the rules of living a normal life. Oliver (Russell Geoffrey Banks) and his Mama (Margaret Roche) are monsters extraordinaire! If Oliver is a sociopath, it is because his not-so-loving mama made him that way. This psycho-sexual, torture film has moments that are hard to watch. It goes right to the edge at times, without completely crossing too far. Far enough that at times I was “WTF”, but I needed to know what would come next. So I stuck with it, and I was glad I did. Who’s Watching Oliver is a crazy film! Oliver’s mama has created the perfect monster — a son that is completely and utterly at her mercy, unable to do anything, except what she tells him to do. And her needs are absurdly demented. Instructing him over Facetime on the computer, “Mama” has Oliver commit the most heinous acts of torture and sexual depravity, just for her entertainment. Luckily there seems to be no shortage of prostitutes in his neighborhood, so his Mama gets a regular show every night. Poor Oliver seems like he might be a bit dim and is very child-like. He spends his solitary days wandering around in a very OCD way, every move exactly the same as the day before…until he meets Sophia. Sophia is also alone in the world, and they start meeting each day. We see the light come back to Oliver’s eyes as they fall in love, but it’s also obvious that he can’t share this love affair with Mama. You start to feel sad for him, even though he is one of most prolific serial killers you could ever hope to not run into. You want him to be able to trust Sophia. Can she possibly love the real Oliver? 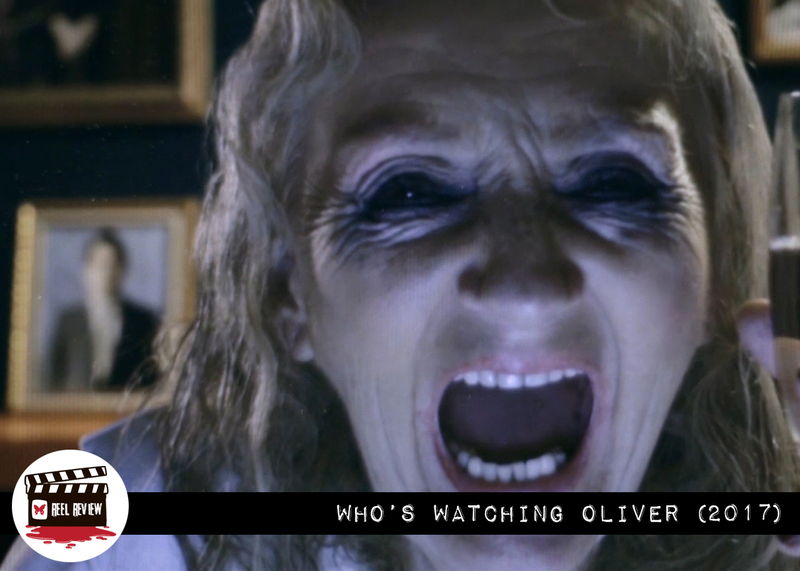 The acting in Who’s Watching Oliver is phenomenal. I had a hard time deciding who was better, Oliver or Mama. Russell Geoffrey Banks, in his first starring role as Oliver, was so believable. You could see what a pathetic puppet he had been molded into. I was shocked to see a photo of Banks not in this character. The personality of Oliver is so completely true that I would never recognize him on the street — kind of a George McFly sorta vibe. Then there was Mama. OMG, Margaret Roche brings us possibly the worst mother of all time. She was amazing! We only see her face on a computer screen, drinking, leering, demanding and controlling Oliver in her horrific, sickening way. The degrading and disgusting things she says! Despite what Oliver does, it is Mama that we hate, Mama that we want to disappear for good and leave Oliver to a better life. She is the absolute essence of a sociopath. This is a character that could have come out super campy, but because of such stellar acting, Roche brings an unforgettable evil to life. Sara Malakul Lane plays the beautiful Sophia, incredibly sad and lost. This troubled girl is strangely attracted to Oliver. Her dark former life makes her vulnerable, and we hate to see her get involved in something that can hurt her as much as her past did. Lane gave a terrific performance, too. I don’t want to share too much except to say that this is a very unique and original story, one that real horror fans shouldn’t miss. It may not be for everyone, it does go to some very dark, sexual and gory places, but the feelings the film takes you to are very real. I wanted to look away, but couldn’t. Having picked up a lot of awards on the way through the film festivals, I have to think Who’s Watching Oliver will be available to the public soon. But at this writing, I have no info on where to see it next. Just know that it is a worthy horror film and deserves to be seen in all it’s disgusting glory. It is a film that will bring out serious emotions, but like a roller coaster, I don’t suggest eating a big meal before seeing this gory, psychological slasher flick. Oh, since this is about the women who give us birth, Happy Mother’s Day. If you love your mom, be glad she’s not like this Mama! For the latest news and information on this film, be sure to like the Who’s Watching Oliver Facebook page.